A sei whale at the surface. 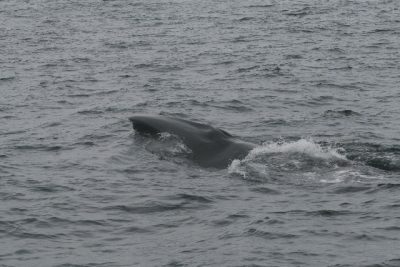 Note the animal’s long body- due to their body length, researchers usually only capture a picture of a sei whale’s back (with dorsal fin), or its head, rarely both together. Image courtesy of the Woods Hole Oceanographic Institution and the NOAA Northeast Fisheries Science Center. Sei whales are dark, sleek baleen whales that are found offshore in subtropical, temperate, and subpolar waters worldwide. They are the third largest baleen whale, reaching a maximum length of almost 20 m (about 66 ft) and weighing up to 30 tons (females tend to be slightly larger than males). They undertake extensive seasonal migrations, spending summer months feeding in higher latitude, subpolar areas and returning to lower latitude, subtropical areas in the winter months to breed. Hunted for their meat and oil, sei whale populations were significantly reduced during the 19th and 20th centuries and are now considered to be an endangered species. The current worldwide population of sei whales is estimated at 80,000 individuals. Limited reports of sei whale calls indicate that the whales make low and mid-frequency vocalizations including pulse trains (peak energy at 3 kHz), broadband “growl” and “whoosh” sounds (100-600 Hz, 1.5 s in duration), tonal and upsweep calls (200-600 Hz, 1-3 s in duration), and downsweep calls (100-44 Hz, lasting 1.0 s, and 39-21 Hz lasting 1.3 s). Most recently, downsweep calls (82.3 Hz to 34 Hz) were recorded in the North Atlantic. Scientists believe this is a “contact” call, as sei whales are traditionally observed alone or in small groups of 2-5 whales. Contact over long distances via low frequency sounds may allow dispersed animals to coordinate activities such as feeding or breeding. The head of a sei whale as it breaks the water surface. Image courtesy of the Woods Hole Oceanographic Institution and the NOAA Northeast Fisheries Science Center. Sei whales feed primarily on dense aggregations of copepods, euphausiids (krill), small schooling fish (e.g. herring and anchovies) and cephalopods (e.g. squid). A strong relationship appears to exist between the vertical migration of copepods and sei whale calling rates. Researchers found sei whale vocalization rates increased during the day, when plankton were at depth and then decreased at night, when plankton were closer to the surface. It is hypothesized that calling rates decrease at night while the whales are feeding close to the surface, but increase with social activity during the day when the copepods are more difficult to capture at depth. The sei whale vocalizations on this page that were recorded at the continental shelf break east of New Jersey, mark the first time that sei whales have been recorded/identified in this region. 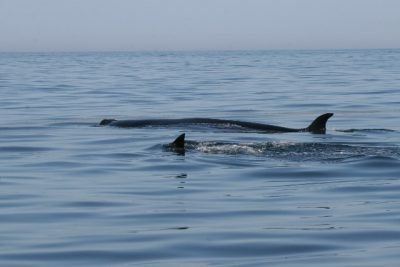 Sei whales typically only travel in pairs or as individuals, however, these vocalizations may be an indication that they are in long-range (>10 km) communication with other sei whales.